We finally got some more snow. Trails around the Eagle River Staging Area and Carson Shelter have been groomed. 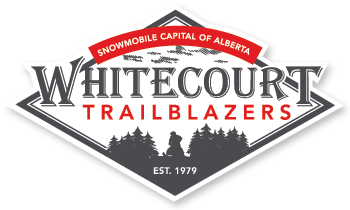 Trail passes are required to ride the trails so please buy where you ride. Groomer will be out all week. Some windfall down north of the Carson Shelter will be cleared again by Trail boss Dave’s crew this Saturday. Trail boss Chet’s crew cleaned the trail again to Gundy Rest Area. Watch for more windfall and use caution around water. Groomer is being trucked across river to start work from the Eagle River Staging Area this week. Athabasca River is frozen is some spots, use extreme caution around rivers and creeks. Trails in the Goodwin Lake area are very icy, use caution. CCCCCold this week…A little fresh snow last Saturday. Groomer is planning to go out next week, hopefully we get a little more snow. Rivers are still open. A small amount of snow today will cover up the icy trails. Be very cautious as rivers and creeks are not frozen yet. Remember to follow the Town and County bylaws regarding OHVs. Trails are still rough and in need of snow. No snow, no grooming, no riding, no fun….